WHAT HAPPENS when your class connects with a class in another location, and that opportunity is not limited to a one time experience? Connections are made. Experiences are shared. Empathy develops and friendships form. Learning expands beyond the walls of a classroom. 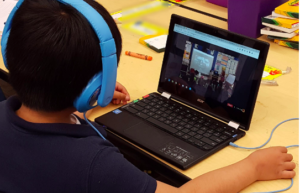 The connection began months earlier…and one special day in February, our classes came together to experience the next phase of learning in a new way. Our daily weather reporting on Flipgrid had taken us to new places, even beyond California and New Jersey! From a special weather report in Alaska, a new experience unfolded. We embraced the opportunity to meet in a live chat! During this chat, we revealed our next activity. This activity would allow us to meet our very own buddies on the other side of the country, and connect one on one, that very same day! When we open up to the possibilities of connecting in new ways, we take a risk. Teachers and learners take risks alongside each other. On this day, we knew there was potential for many things to go wrong. As teachers, we knew that there would be 43 Kindergartners counting on us to give them the experience. The video captures all of the magic of that day, but what it does not show is their perseverance and the patience it took to get there. The first part of our chat was filled with challenges when only one class could hear the other. Problem solving mode kicked in…at the same time we managed maintaining the flow of real classroom life, and the needs of 5 and 6 year olds! It was far from perfect during that time. Yet, within that, lessons were learned. The children saw their teachers problem-solving. They contributed to possible solutions. They watched others around them step in with ideas…they saw that no one knew the answer right away. We persevered alongside each other, and when we got it to work, our reward was finding each other. The experience took on its magical feel in part because we had to work to get there. We had worked on developing our connection, and we had to work to find each other that day. The reflection of the experience continues to deepen, even as we are in the process of watching the video together. Children were drawn back into the process as they were given access to this visible document of their learning. Just as we are taking time to reflect as teachers, they are accessing their own reflective strategies. The next day they began asking for each other, writing to their new buddies independently, carrying their connection into art, writing, building, and pretending. The depth of their connection continues to settle in as we take our cues for what they need next. It is a process that we are in together…connect, wonder, play, and discover. Feelings Reflection – The kids tapped into their feelings before and after the live time chat. They were given a reflection page that was front and back, one side for before the chat and the other side for after. 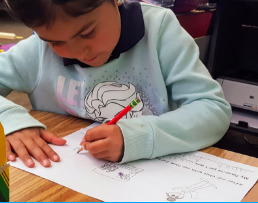 While identifying their feelings before the chat, the kids also drew mental images and wrote a sentence to share what they were wondering about in regards to connecting with their friends and the chat itself. After the chat, the kids shared their favorite part of the live chat experience. The kids’ completed reflections can be compiled into a spiral class book. It will be a 2 in 1 book! Postcard Creating and Flipgrid Sharing – For this activity, children each received a postcard with a photograph that matched their buddy/buddies in the other state (Buddies had been previously partnered using Google Sheets to organize virtual buddy partnerships. Interest, personality, and characteristics of each child were considered when forming partnerships.) Children were each given a blank postcard template to write about their own special place. 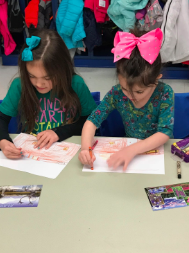 After illustrating, children turned to the customized Flipgrid to find the matching photo postcard which revealed each partnership as a topic. Each child created a video response introducing their special space within their Flipgrid topic. Follow up lessons offer the opportunity for authentic postcard writing, and mailing to their buddies. 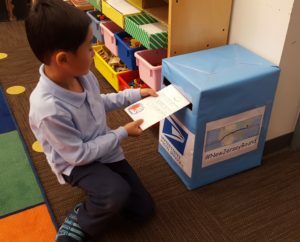 Extension: Special Buddy Mailbox have been added to each classroom for spontaneous letter writing to buddies and classmates in the other state. As we continue to unfold our story for you, we hope to share activities that can inspire and offer you opportunities to think beyond the limits of time and space. We want you to see the ways we take direction from the kids and build on what THEY need, and interests they express to us. Our posts will share concrete examples which allow us to address curriculum and learning expectations in meaningful and authentic ways. This entry was posted in 17-18 Kinder Collaboration, Flipgrid, Innovating Play, Kindergarten by Christine Pinto. Bookmark the permalink.